Dear faithful disciples of Jesus throughout the North American Lutheran Church. Grace, mercy and peace to you in the name of the One whose birth we celebrate! 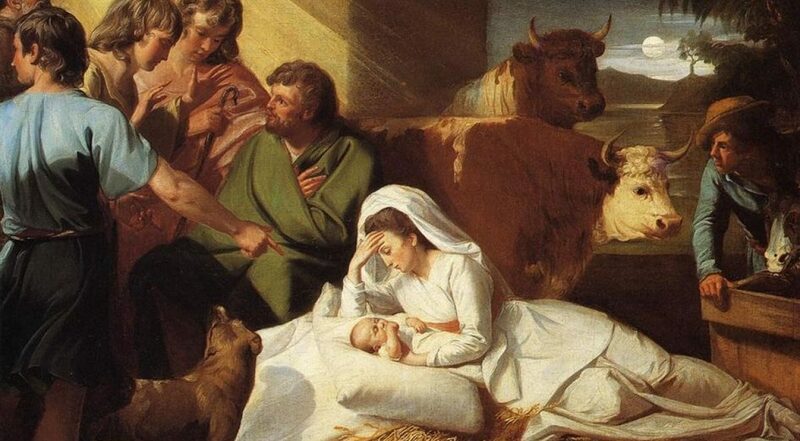 Let us, then meditate upon the Nativity just as we see it happening in our own babies. I would not have you contemplate the deity of Christ, the majesty of Christ, but rather his flesh. Look upon the Baby Jesus. Divinity may terrify man. Inexpressible majesty will crush him. That is why Christ took on our humanity, save for sin, that he should not terrify us but rather that with love and favor he should console and confirm. Behold Christ lying in the lap of his young mother… What can be sweeter than the Babe, what more lovely than the mother… Look at the Child knowing nothing. Yet all that is belongs to him, that your conscience should not fear but take comfort in him…. The beginning of the Christmas Gospel reminds us of Mary’s condition. She is pregnant, with child. What she has experienced since the first proclamation from the angel Gabriel was just as miraculous. The growth and development of a baby in the womb from just two tiny cells is a miracle. These cells continue to divide and multiply as the embryo attaches itself to the lining of the uterus. After five weeks, the embryo is the size of a grain of rice. It has a brain and spinal cord. After six weeks, the heart is beating and you can see the eyes, ears and head. After seven weeks, the arms, legs and nose are visible. After eight weeks, the baby is only two centimeters long but you can still see its fingers and toes. The perfect alignment and connection of every cell is a wondrous miracle. In the growth and development of every baby we are participants in God’s gracious miracle of creation and new life. Unlike any other mother, Mary is given the chance to participate in the birth of God’s Only Son, the Savior of the World, Jesus Christ. On the other hand, just as in every other mother, the same things that unfold in the growth and development of every other baby are happening to Jesus inside of Mary. Through the joy and wonder, Mary is nonetheless confused, disturbed and filled with questions, yet she responds with faith-filled obedience. Luther comments that there were three miracles on Christmas: the Incarnation — God became a person, Mary remained a virgin and the greatest miracle of all was that Mary believed. She trusted God’s promises and held fast to the words of God’s messenger. Through such faith Mary is transformed and renewed, a new creation. Mary heard the proclamation that God wanted her to be in a relationship with Jesus. She was to play a part in His mission to save and redeem this world. This is the way faith begins in every person. We hear the message that Jesus wants to be in a relationship with us. He longs for us to respond like Mary: listening, believing and obeying. In pregnancy, the changes for Mary or any woman come slowly, but the direction is set and her life will never again be the same. From deep within her body Mary began to make room for Jesus. So it is with faith. When we believe and respond obediently to the call of Jesus to be a part of His body, the Church, we begin to change and others begin to take notice. As in pregnancy, so in faith, everything begins to change. Mary’s life was transformed physically, emotionally, mentally and spiritually. Viewing this miracle in my own wife, Kristi, four times and in our daughters, I am certain Mary’s behaviors, habits and worldview also changed. She had new priorities. She was nurturing a new life inside her body. She was becoming a community, a family. The responsibility and accountability were inescapable and sometimes overwhelming. We live one way before our children are born and another way following their births. Faith in Jesus begins a similar process within us. He transforms every aspect of our lives, and through His word imparts a Kingdom of Heaven worldview. Our lives are changed forever. Take time this Christmas to observe the intimate connection between a mother and her child. You will see a tender, nurturing relationship marked by sacrificial love. You will see the powerful priority of that relationship. Through faith, the Holy Spirit draws us into an intimate, loving relationship with Jesus. Jesus said that He wanted His disciples to be one with Him, as He was one with the Father. Faith draws us ever closer to Jesus. The relationship with Jesus comes before all others. We prepare to receive children into our lives by first making a place for them in our hearts. We make a place for that new life in our relationships. Then we make a place for them in our homes: a bed, a crib, a nursery. We prepare by purchasing car seats, changing tables, high chairs, strollers, blankets, clothing, diapers, formula, diaper bags, toys. The list seems endless. This preparation is a way to practice putting this new life ahead of our own. It is a way to practice the selfless love necessary to nurture a new life. Regardless of the cost, we give all we can. We want to give our children the best life possible. Our faith starts by making a place for Jesus in our hearts. That’s what Mary did when she heard the Good News. We are called do the same. Jesus has a place in our relationships, a place in our homes. We support the mission of His Church with our offerings so that others will have the same opportunity. It is our way of practicing selfless love, putting Christ ahead of self, an expression of our love for Him. The Christmas Gospel announces His birth. The pain and struggle of labor produce the delight and fulfillment of new life, a baby. What was invisible is now seen. What was untouchable now reaches out to hold our finger in His little hand. Those same hands created the entire world and sustain everything in it. With a new life in our hands, more work and responsibility follow: sleepless night, feedings every two hours, changing diapers, burping, comforting, rocking, bouncing, listening to their sounds, observing their smiles and grimaces, watching them grow and change by the minute. Life becomes more complicated, not less. The cost increases until it seems as though we have given everything. So too, in following Jesus we take up our cross in response to His ultimate expression of selfless love, giving His life on a cross for our redemption and salvation. This new relationship is not something we are meant to engage in alone. We were designed to be in community, and our children were created to be in a family. In our relationship with Christ we need His community, the Church. As our children are baptized we express that same truth. It is only in His community that we continue to grow and mature spiritually, through Word and Sacrament. In community, we live life in Christ as His disciples. We learn how to share this faith in Jesus with others and nurture them in the faith. We become disciples, equipping others to become disciple makers. Through the same Holy Spirit, we are participants in the spiritual rebirth of others who come to know and follow this One born in Bethlehem. The world tells us that our purpose is to make our life easy and carefree. Jesus says we are called to a relationship of faith in Him that is lived out in our vocation and through loving relationships marked by mutual responsibility and accountability. That is the fruit of love. When there is less time for me there is more time for life, for loving others. This Christmas we move with Mary from pregnancy to delivery, from making room for Him to embracing Him. We move from the hope of promises proclaimed into the reality of an obedient faith. While we have made room for Jesus in our hearts, homes and relationships, Christmas reminds us that the greater reality is that He came to proclaim a far greater truth, that He has created a place in His heart for every one of us. Those who follow Jesus not only become a part of the Kingdom of Heaven, but the Kingdom of Heaven becomes a part of them. They not only enter the Kingdom but the Kingdom enters them. The life we live is the message we proclaim. May He who made Himself manifest in the world be manifest in our lives. Christ is Born! O Come, Let us Adore Him! Beautiful message. Thank you and have a Blessed Christmas!